You guessed it. . .
Yep, that's right! 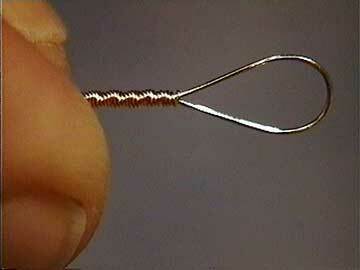 A loop end string is a string with a loop on the end. If you're new to stringed instruments it may not be obvious that strings come this way. You don't have to twist your own loop on the end, and that's a good thing, because it's not so easy to do. Banjos, mandolins, dulcimers, and a host of ethnic fretted instruments have tailpieces that are most conveniently strung with loop end strings. The strings simply hang onto little posts or hooks, and that's all there is to it.